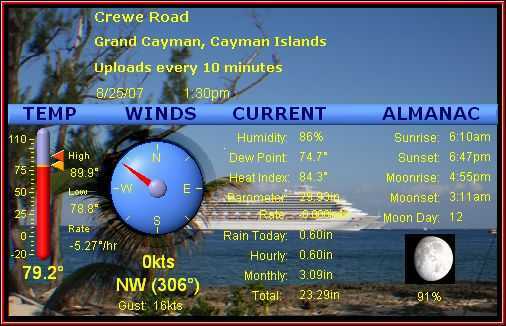 A late season cold front is currently influencing the weather here in Grand Cayman. Yesterday the winds switched to the NW at 5-10 knots. Earlier today winds increased 10 -15 knots from the NE with partly cloudy skies but are now from the N at 10-15 knots with cloudy skies. I don't expect any rain. Nice evening to sit on the porch and enjoy what will probably be the last bit of cool weather before next winter season. It certainly is a nice change in weather from the 85°F and above temps with hight humidity we have had the past week. It was beginning to feel like summer. Come to think of it.... only 6 weeks left for the start of hurricane season....YIKES!! Cold front is on the way and forecast to begin affecting us early afternoon. The morning began with overcast skies. Currently it is partly cloudy with winds South at 5 knots. Temperature 84°F. The official forecast is Partly cloudy with isolated showers this morning gradually becoming cloudy to overcast with intermittent showers and some thunder this afternoon. Winds South 5 to 10 knots this morning shifting to the north and gradually increasing this afternoon, north 15 to 20 knots tonight. Seas will be increasing along the West and North Coasts as the front moves through our area. Looking forward to the cooler temperatures. Congratulations to our eldest son William on successful completion of his commercial flight training at Flight Safety Academy, Vero Beach, Florida in January. Today is his first flight as First Officer on Cayman Airways Express, our local inter-island airline. I messed up on the size of the image in my last post. Here is one that should fit the screen better. The night started out a bit hazy, but soon cleared to a brilliant, clear night, perfect for star gazing. (I still need to learn how to use my dSLR features). Even though I used a tripod, some of the pics I took were a bit shaky. Weather wise, we have been enjoying 10-15 knot winds from the SE. High temps in the Mid 80's and lows in the mid 70's. Rainfall is minimal, with the occasional light shower. Lot's of sunshine!! LUNAR ECLIPSE:  On Wednesday night, February 20th, the full Moon will turn a delightful shade of red and possibly turquoise, too. 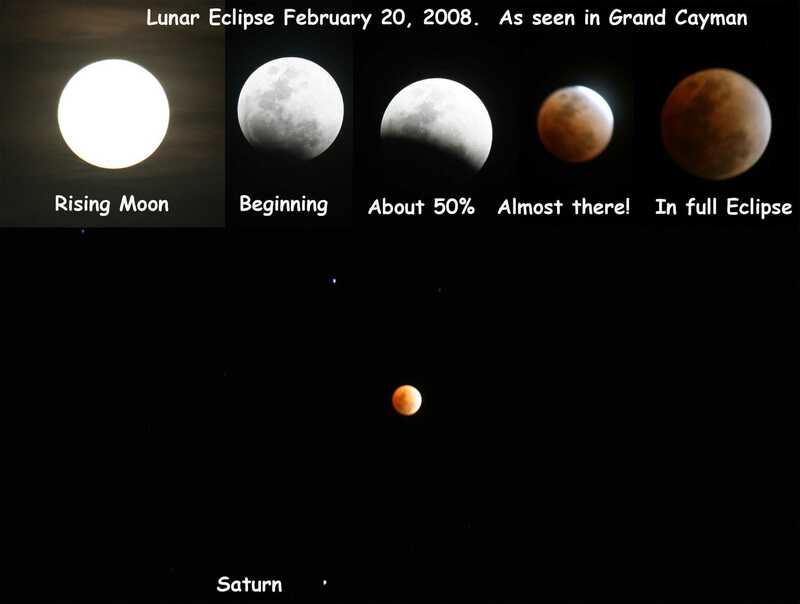 It's a total lunar eclipse—the last one until Dec. 2010. Sky watchers in Europe, the Americas, parts of the Middle East and Africa are favored for good views of the two-hour event. Visit http://spaceweather.com for full coverage including maps and timetables, live webcasts and discussion. Great weather in Cayman. Highs in the low to mid 80's. Lows in the mid 70's. Very little rainfall, 0.48" for the month so far. It is our dry time of the year. Enjoy the eclipse...looks like we will have a clear night. Maybe I'll post a picture of it. Great weather here to bring in the new year. At midnight the sky was filled with fireworks and was quite magical. Everywhere you looked, there were fireworks going off and it went on till almost 1am. Lots of tourists in town and everyone seems to be having a great time. Well with the winter season here the island is busy with tourists, nice to see some stay over guests on the island and not so many crew shippers, I bet there are a few store owners in George Town that don't agree. Any way the cooler water temps have made the fishing a little more active! Have a look at the picture. Highs in the mid 80's, night time high 70's. Caribbean living is a fine thing this time of the year! Wherever you are, I wish you all a Merry Christmas and happy holidays. 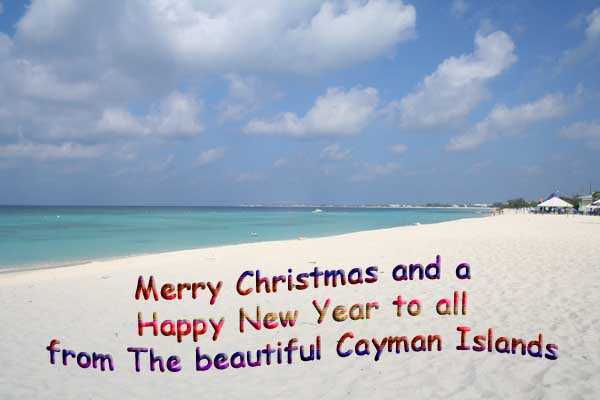 Here in Cayman it's a great day to go to the beach and to be with loved ones. Many people have packed lunches & Champagne for beach side celebrations. Here is a picture taken at lovely Spotts beach. Christmas is here and the island is busy with shoppers making their last minute gift purchases. Absolutely beautiful weather, sunny and warm 82°F, light winds from the NE and 50% humidity. The forecast is the same for the next couple of days. Have been keeping track of Santa's whereabouts at http://www.noradsanta.org/en/home.htm for those interested. The low pressure center of the remnant "Olga" is now northwest of Grand Cayman having passed just north of the island this afternoon. The winds switched from the NE and are now from the West at about 10 knots. The winds will continue their counterclockwise rotation as the low pressure continues its westward trek and is no longer an influence on our weather. Then back to the Christmas breezes...hopefully. The local weather service had us on 'severe weather alert' from last night, but so far there has been only occasional drizzle and winds 10 - 15 knots, certainly nothing severe yet. (Better safe than sorry) Maybe some of the trailing clouds will bring us some much needed rain. We are still 20" deficit for the year according to my records. The background is of the endangered blue iguana of Cayman. I took this picture a few weeks back while walking the trail at the Queen Elizabeth Botanic Park. They are not aggressive and will pose for for the camera. Here is link to the iguana website and botanic park for more information. Have a great week. Merry Christmas to all. Talk about unwelcome news!!! Everyone here is preparing for Christmas, many people have put up decorations and lights on their homes and there is not a hurricane shutter to be seen. Now Olga seems to be heading our way according to current computer models. Cayman better keep an eye on this storm just in case it stays on its current path. First post, so I figured I would start during a "non stressful" moment! 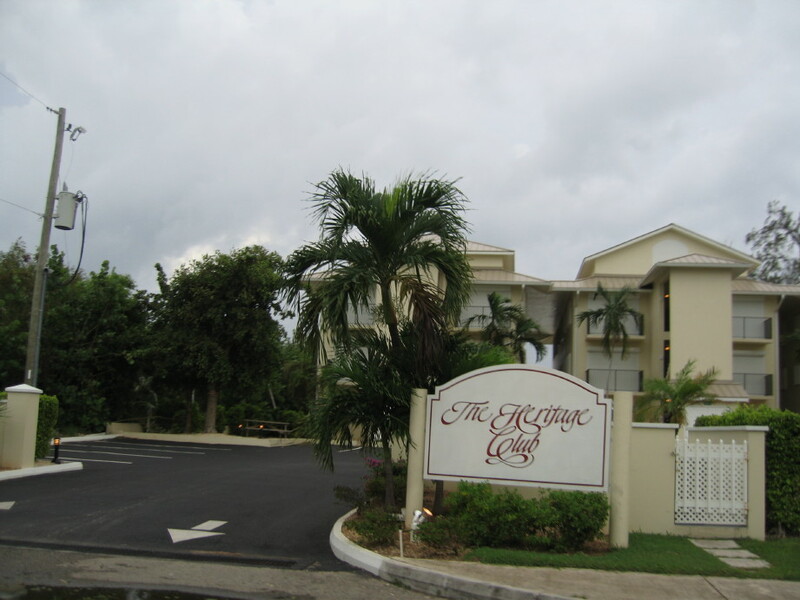 Its been raining on and off here in Cayman for the last few days. A sprinkle here and there but nothing significant. Many people have taken down their hurricane shutters ; we will do that soon also. 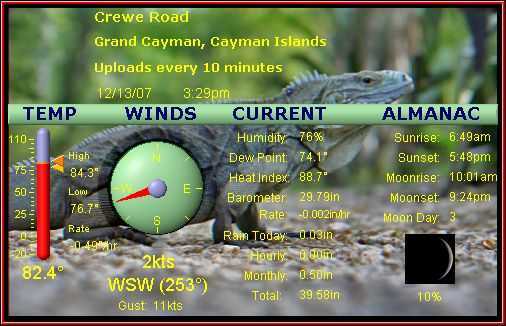 The best part now in Cayman is that the evenings are nice & cool; those "sauna days" of July and August are finally gone. Even many locals found this summer very hot. My wife & I are now enjoying walking the dog in the comfortable warm and slightly windy evenings. Have a nice evening! I hope nothing else will show up between now and the end of the month. Dean sure gave us a scare back in August. JUst got my latest update and Tropical Depression 16 has been upgraded to Tropical Storm Noel. I was just telling my husband that I'm already feeling the Christmas spirit...what a premonition. Noel... Noel.... Noel... Noel! 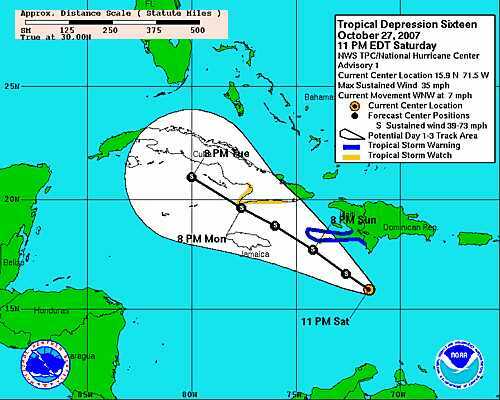 Tropical Depression 16 has formed South of Dominican Republic. http://www.nhc.noaa.gov/text/refresh/MIATCPAT1+shtml/280230.shtml? Heads up Cayman especially Cayman Brac and Little Cayman, Jamaica, Cuba, Haiti, D.R. Wake up Cayman, now is not the time to become complacent, we still have 5 weeks of official hurricane season left. 90I is to our East and heading this way! Yikes! Today was a beautiful day in Grand Cayman, partly cloudy, winds were ESE 10-15 knots, with a passing shower that dumped 0.10" of rain, enough to stop me from bathing the dogs for a few minutes. 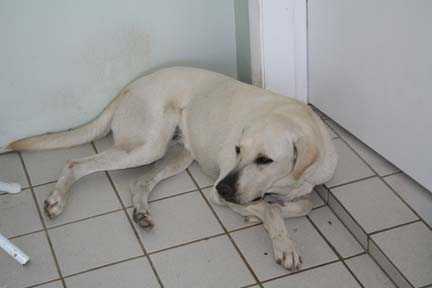 One of my dogs ( I have 4) has been missing since Friday Morning :-( so there is a 'gloom' hanging over my household. Posters are out, radio announcement, Vets and humane society made aware, and the pound. It's just not the same without 'Sprite'. A lively and fun dog, loves to catch the ball and chase the laser pen light. Sprite in her favorite spot! The "cold" front probably won't make it this far southeast. Rainfall is near normal for the month so far. I have recorded 8". We are however 12" below annual average. Since my last post, 94 I is no longer on the radar, but it left behind a 'disturbed' weather system which has turned into a surface trough between the Cayman Islands and Jamaica, stretching over Cuba and into the Bahamas. This system has brought us cloudy skies, significant rainfall, lightening and thunder. Tuesday evening the real heavy rain started which resulted in 2.6" in 4 hours. Since then we have been experiencing intermittent heavy showers with thunder. Last night at around 8pm a thunder storm to the south produce quite a lightening show that was worth watching. Total Rainfall since Tuesday is 4.6". "Cloudy to overcast skies with intermittent showers and some thunder. Squally winds and rough seas will accompany locally heavy showers." Rain Rain and more Rain, what a nice day to lie around and do nothing. Looks like this weather might be around for a day or two Invest 94....... can't wait for the first cold front to start cooling the sea down. Wahoo like the cooler sea temps too! Overcast day here in Grand Cayman with a few showers. None at my location. I see we now have 94 Invest in our area, with the low pressure center near Swan Island. That is approximately 180 miles to our southwest. The barometer has been falling today, is now 1007 hPa, 29.74". We wait and watch to see if this system develops. Here is the National Hurricane Center's 5:30pm report on the system. DAYS AS IT REMAINS NEARLY STATIONARY. No Rain at this station. Cloudiness and showers, associated with the broad area of low pressure centered North East of the Bahamas, have been affecting Grand Cayman and the Cayman Islands for the past several days. The official forecast indicates it clearing by tomorrow. Looking at the satellite map, we are on the Western edge of the cloud cover. I guess it will depend on where this low decides to go that will determine how much more rainfall we will get. The models show it heading SW over the next few days. So far for the month I have recorded O.81". Other areas have probably received more. September rainfall was 50% below the average for the month which translates to an annual deficit of approximately 10" as of September 30. We will need 20" in October to make up that deficit. Possible? Yes! Likely? We'll have to wait and see. We have not had the usual heavy downpours (6" at a time) that last for hours so far this year. Looking at the records, the highest recorder for October was 22" in 1998. The lowest was .25" in 1994. Daytime temperatures are still >88°F, but the rainfall and cloud cover have given us a relief. Today's high was 84°F. I am looking forward to cooler temperatures of the 'winter' season. Barometric Pressure 1011 hPa 29.85"
It is now 8:45am and has begun to rain. Thunder in the distance. 100% cloud cover in all quadrants. We need the rain as we are about 15" below normal. Hurricane Humberto, from a depression to hurricane in about 14 hours, made land fall just west of Port Arthur / Beaumont Texas. Earlier, I spoke with my family who lives in there Port Neches, and understand that some areas were without power. Hang in there y'all. Winds East 10 -15 knots Gusting to 25Knots in the squall. Before I could complete and hit send, that squall has passed through, winds have died down, thunder continues in the distance. The outer bands and remnants of Felix seem to be affecting Grand Cayman this afternoon (George Town area at least - although the sat maps suggest the crummy weather is island wide). We certainly needed the rain, but hopefully it isn't too much to cause flooding anywhere. It is dark outside and raining quity heavily (and has been for about an hour now), there was thunder a lightening about half and hour ago. Hopefully it will pass as quickly as it arrived. My hearts go out to those affected severely by Felix. Glad to hear Roatan got lucky as I have have an uncle in law in the Bay Islands and haven't heard anything from him yet. Hope Graham's Place is still good and his pets were not disturbed by any bad weather. Wake up.... everyone in the Western Caribbean, Felix is now a Cat 5 Hurricane with 165mph sustained winds with gusts to 200mph, tracking WNW 285°. He is NO longer a kitty cat, but rather a Lion :-) Roooaaar. Definitely don't want this cat in my back yard. Cayman, Stay alert, we are not out of the woods by any means, a little weakening in the ridge that is keeping Felix tracking W to WNW, would probably cause the storm to track more northward, bringing it that much closer to us. No matter where he goes, we can expect to have high surf along the south coast...Remember Mitch, Michelle, Georges and others, these were storms that were over 200 miles from us, yet we experienced high surf along the south and west coastline. Everyone in the Bay Islands, Belize, Honduras..... Batten Down. Stay safe. Move away from the coast and seek higher ground away from rivers, gullies etc. Listen and pay attention to your local authorities. This is one dangerous storm. Hopefully that is the only warning we will be issued. You all probably know by now to still keep tuned until Felix passes us - whether it be well or not it is well to our South. I guess we will know a little more about whether Felix will come closer to GC by Monday, and if it does take a more northerly track, then we will have at least a day or so (hopefully) to get ready. However, I imagine everyone on the island is pretty much set since the Dean scare. Yikes.... Felix is now a 65mph Tropical Storm, (soon to be a "Cat 1") is forecast to be a major "himmicane" when it reaches the western Caribbean, and remain on a westward track. Heads up Honduras, Nicaragua, Belize and all the islands off the coast in the forecast track. Great weather here in Grand Cayman. Sunshine, few clouds , Temperature 90°F and winds 5-10 knots from the SE, makes a great day for the beach, fishing, flying whatever you fancy. Flew over to Little Cayman with my brother on Thursday for lunch. An great flight, calm winds. Temperature at 5500', a pleasant 68°F. The day began sunny and hot, with the temp climbing to near 90°F by 10am. With conditions ripe for that early afternoon thunderstorm, that changed in the past hour as convective cumulus clouds built, and then.....Lightening, Thunder and Rain.... some quite close to my location. That system has dumped 0.60" rainfall so far and has now moved on to the west, now mainly out to sea. Still thundering in the distance. Temperature dropped to 79°F with that storm. Still overcast. Maybe more rain later. Looks like we may be in for some much need rain today. We need it to wash the salt off of the foliage, courtesy of Dean. The system that is seen on the satellite pictures is now passing through Grand Cayman. Light drizzle now and I hear distant thunder. Partly cloudy skies this morning becoming cloudy to overcast with scattered showers and some thunder by early afternoon. Showers will be locally heavy at times. Winds over open sea East to southeast 10 to 15 knots with higher gusts in and around heavy showers. Sea State Moderate seas with wave heights of 3 to 5 feet. Have a great day. To work I must go. With the drop gorgeous weather we have this morning, who would have thought that a major hurricane had impacted the Cayman Islands just yesterday. I am, as well as others, sooo thankful that Dean passed 100 miles south of an and was not a direct hit. Now he is doing his damage over the Yucatan. Thank you Tara and Gareth for the photos posted. The airport is up and running now, Just heard an airplane take off. Now comes the fun of getting the 7000 or so evacuees back on island. after 14 hours of sleep I'm ready to put all the supplies away where they live.....all shutters to be out away. I'll put that generator gas in the cars, at $4.38 CI a gallon I'm not wasting that, The diesel will go towards a fishing trip this weekend. Back to my Mom's house today to put her garden back together. I think it safe to say...with a few more hours of work "tings" is going to be normal.....people are back to work today. I'll go tomorrow! My thoughts are with those who the storm as affected much more severely. Cayman got a pass on this one. No surfing for me though, a few of my friends paddled out, I'd rather finish what I have to do and go back to bed. Maybe some fishing pictures this weekend!!! I'd like to post those, no more hurricane talk this week for me. Apologies for the delay in posting pics, but my comp broke down, fortunately I have back up. Winds are minimal right now, but still some gusts. Going to sleep soon. Business as usual tomorrow. Here are some pics I promised to post. I don't know if these pics are of any interest to you, but please feel free to put them on StormCarib if you wish. 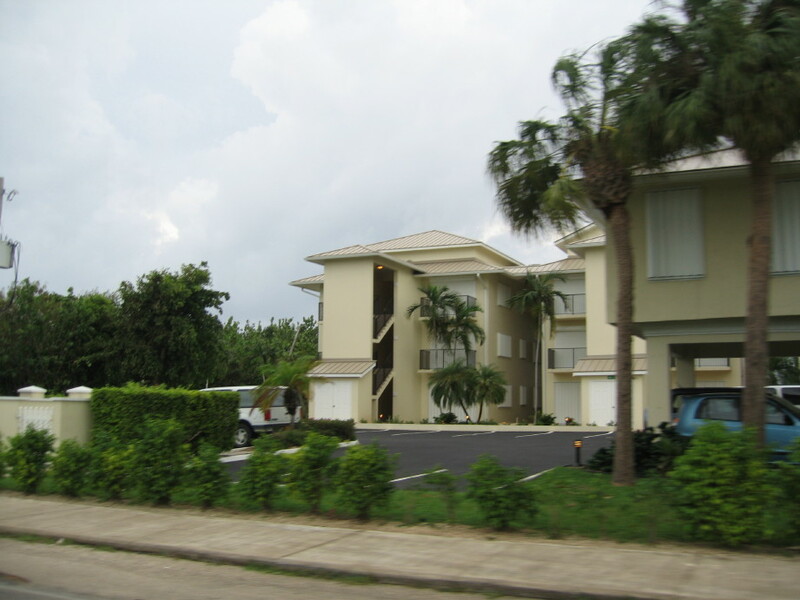 They are of Cayman Crossing in South Sound. 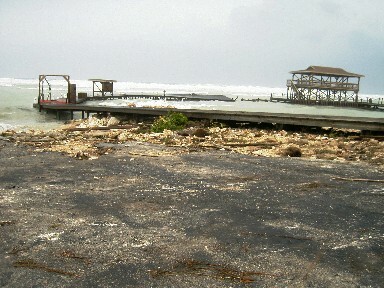 The complex fared well but our dock over the road was destroyed. South Sound Road is pretty much impassable and currently closed. well I'm happy to report that the power is back on here in West Bay. The curfew was lifted at 2pm. The sea is BIG hope fully things work out and we get a little surf. I did a quick drive around West Bay no major damage, not sure what happen on the south coast....but seeming that's the first stop for any storm coming out of the south I'm sure there must be some .........well I haven't been down there so I don't know. I'm going for a drive later and will post what I see. Grand Cayman was LUCKY some say thank god ,some say thank your lucky stars.... I'm just thankful! Belize take care. My thoughts are with any one in the path of Dean! I’m back now at Govenor’s Harbour. Still blowing away here but only damage is we lost the lanai roof. On the way over here on the bypass we did not see much damage. A few branches on the road and some bent signs. There was one electric pole down on Shedden Road but was being repaired already. Curfew has been lifted but I am not sure of the All Clear has been given as yet. Have not heard any reports of flooding but have not spoken to anyone on the water. Boats in the harbour are all fine but just north of us toward the yacht club we can see a sail boat mast sticking out of the water. May drive to West Bay to get another car so will post conditions out there if I do. 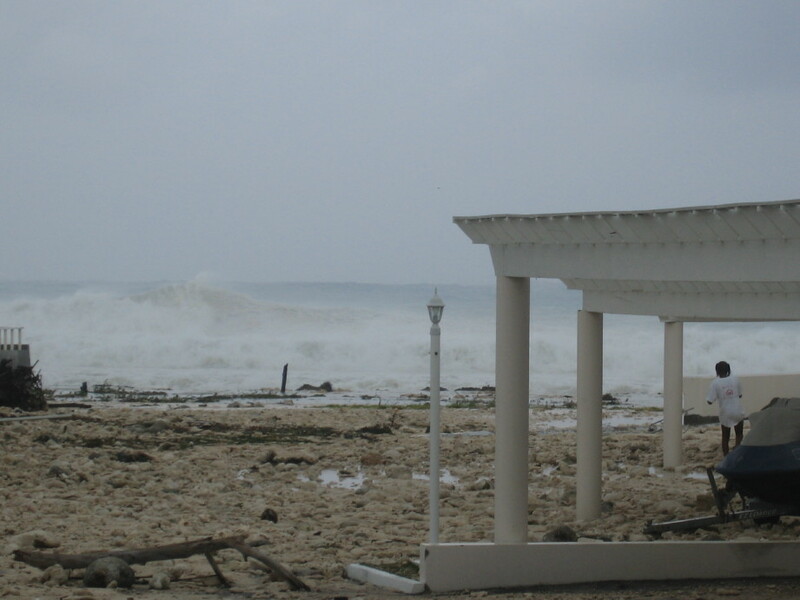 Grand Cayman continues to experience tropical storm force winds but the weather outlook continues to be promising. As a result, the Government issued the all-clear at 4:30 pm today. This follows in the wake of the lifting of the all-island curfew for Grand Cayman at 2 pm today, both events an expeditious resolution to a dramatic three days that ranged from fears of a Category Five direct hit to the maximum impact of gusts of 64 mph recorded around 8.30 am this morning. In addition, there has been minimal rainfall and no weather-related injuries. 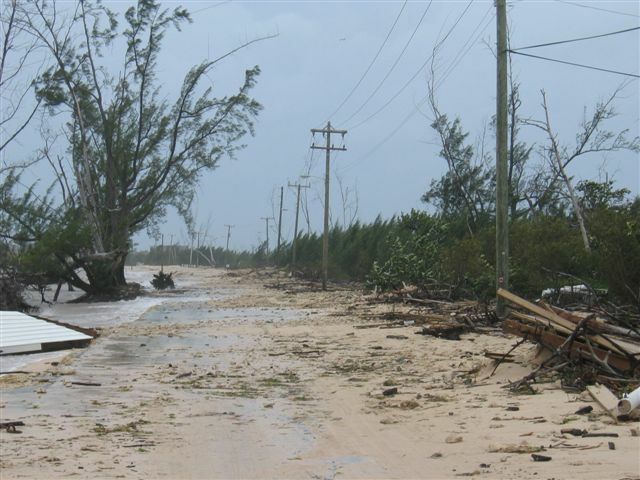 - Curfew lifted but not the "All Clear"
Title: Curfew lifted but not the "All Clear"
The Curfew on all areas of Grand Cayman was lifted at 2 pm today, but the All Clear has not yet been declared as Hurricane Dean continues to affect Grand Cayman. Until the All Clear has been given, members of the public are urged to exercise extreme caution for their own safety and well-being when traveling on the roads. While road clearing is ongoing, some areas are still impassable. Especially flooding in the Savannah gully makes driving to and from the East impossible at the moment. While Curfew was declared to maintain law and order, the Hurricane Warning is still in effect to protect people from the ongoing dangers of Hurricane Dean. The All Clear will be declared later today when the worst weather has abated. However, people should adhere to all road closures and continue to listen for public safety updates specific to their area. 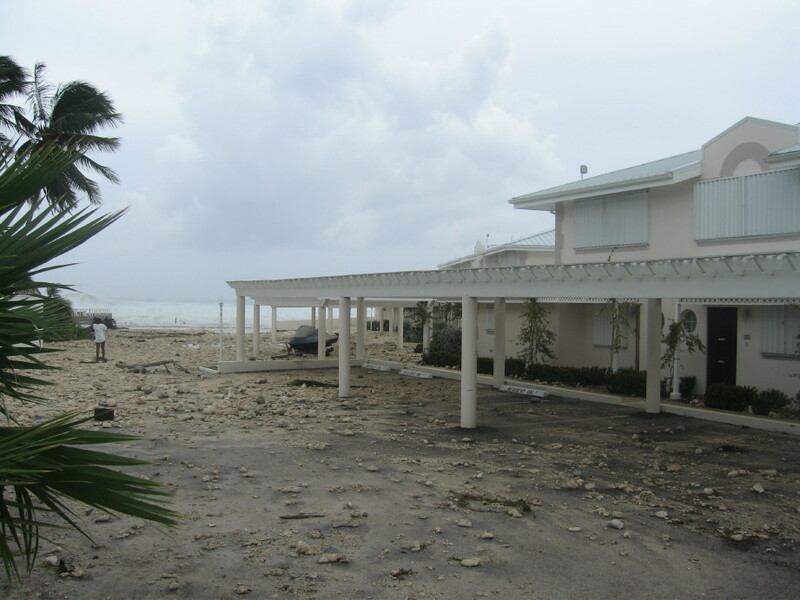 Grand Cayman (20 August 2007) - Although spared the worst as the centre of Hurricane Dean passed to the south of Grand Cayman, there were reports on Monday of wave damage to buildings and debris in the roads along coastal areas. 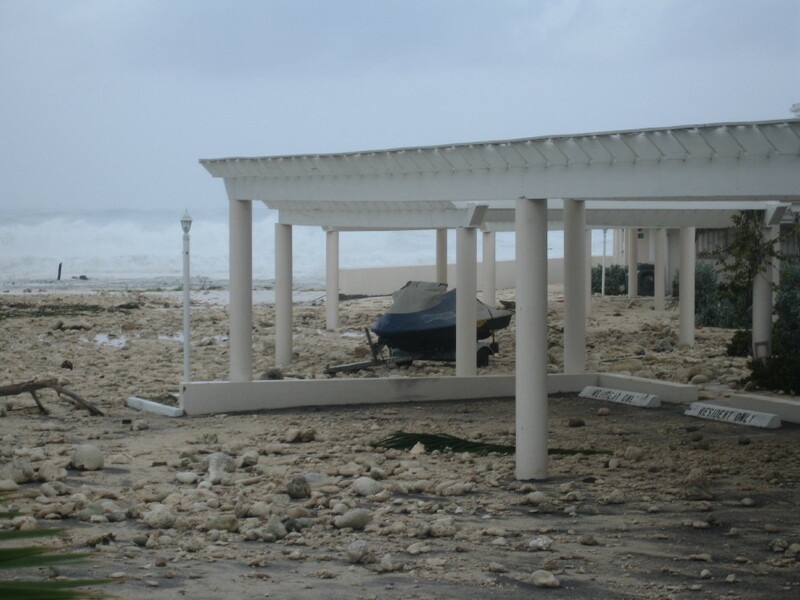 Waves of up to 20 feet in some places were reported along the south coast of Cayman, which, as with Hurricane Ivan in 2004, bore the brunt of the storm's ferocity. 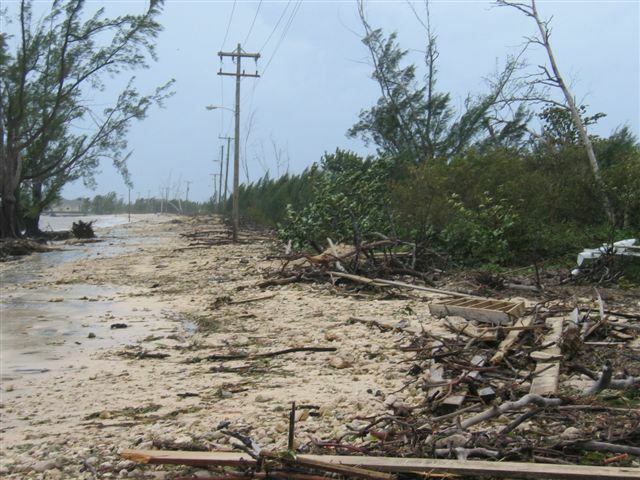 There were reports of wave damage along the south coast and flooding in especially low-lying areas of Grand Cayman including the Savannah gully. 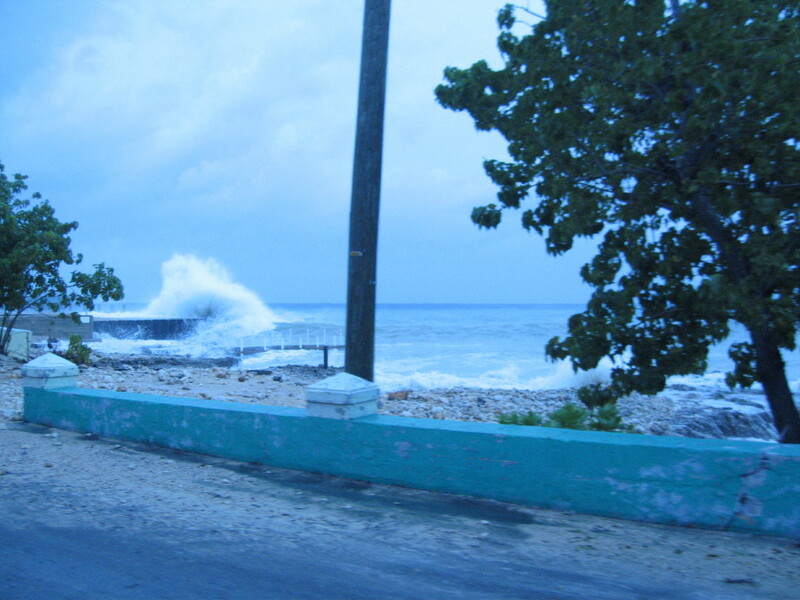 High waves were expected to continue to pound the south-east of Cayman until Tuesday morning. 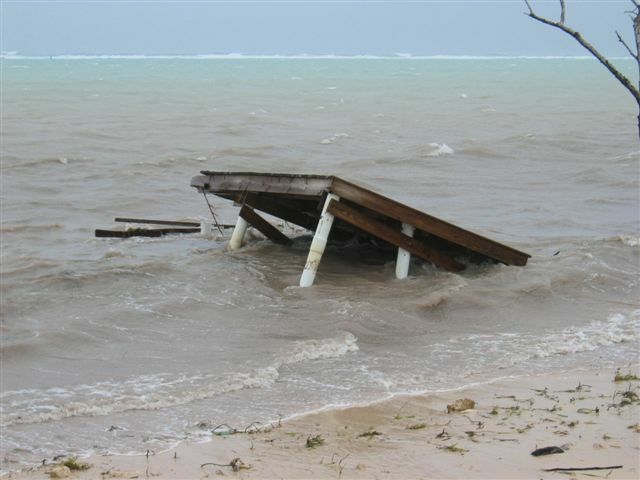 There was also some damage reported to docks and other coastal features along Cayman Brac's south coast. 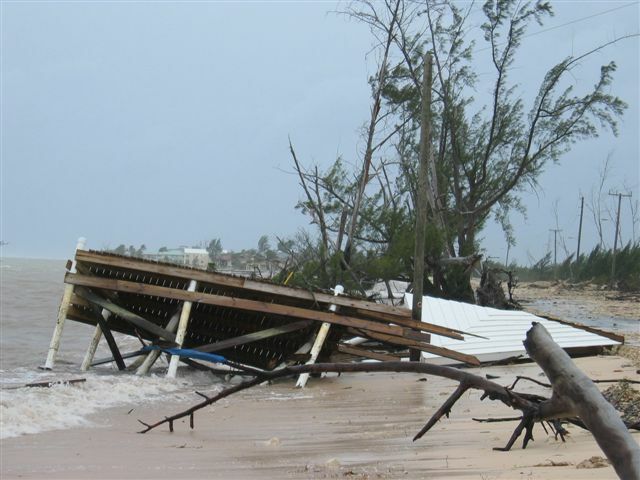 Government Information Services reported that the strongest winds were gusts of 57 miles per hour (mph) on Grand Cayman around 6am on Monday. 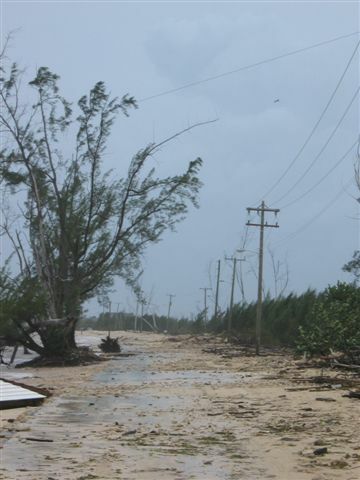 Power outages were experienced in some areas of Cayman, Caribbean Utilities Company (CUC) said. Eleven of the power company's 23 circuits lost power at varying times on Sunday and Monday, affecting a number of areas of George Town, West Bay and Prospect, but company engineers said they expected all circuits would be restored by late Tuesday, if not before. 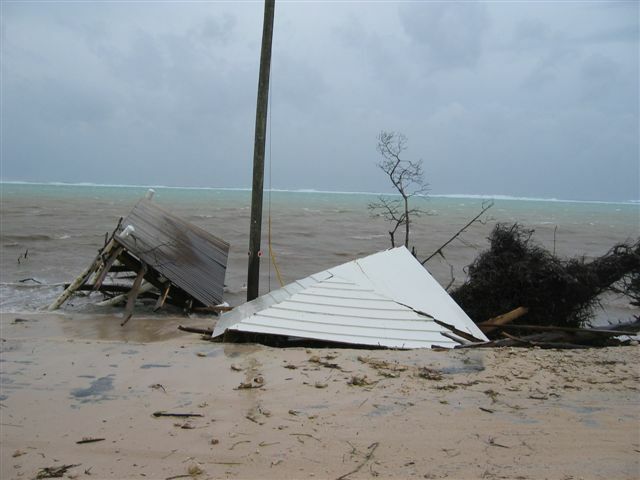 At 1pm on Monday (Cayman time), the storm was located at 18 degrees North and 83.2 degrees West, or about 330 miles east of Belize City. 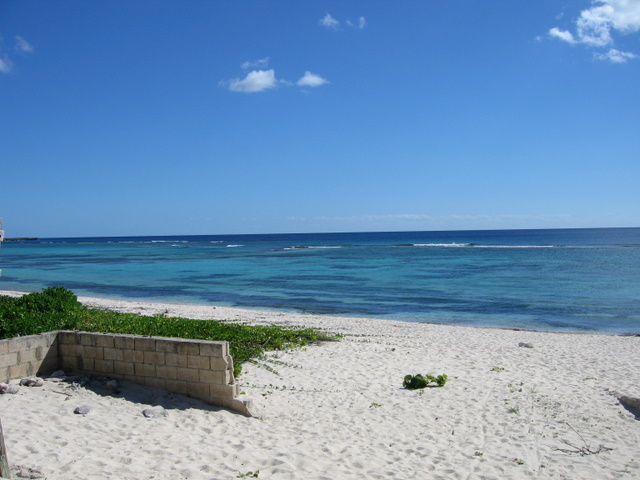 (Grand Cayman is located at 19.2 degrees North and 81.2 degrees West.) Sustained winds were reported at 150mph with higher gusts. - The Royal Cayman Islands Police Service reported "no incidents of note" during the storm and was maintaining vehicle patrols on Monday. There were no reports of casualties by Monday lunchtime. - Water was disconnected at 11pm on Sunday as a precaution. - About 1,800 people spent the storm in government shelters. - A curfew was imposed at 10pm last night and was due to be lifted on Monday afternoon, although there were reports of some people having ignored the curfew. - Cable & Wireless said its telecommunications systems were operational and had not sustained any apparent failures during the storm. 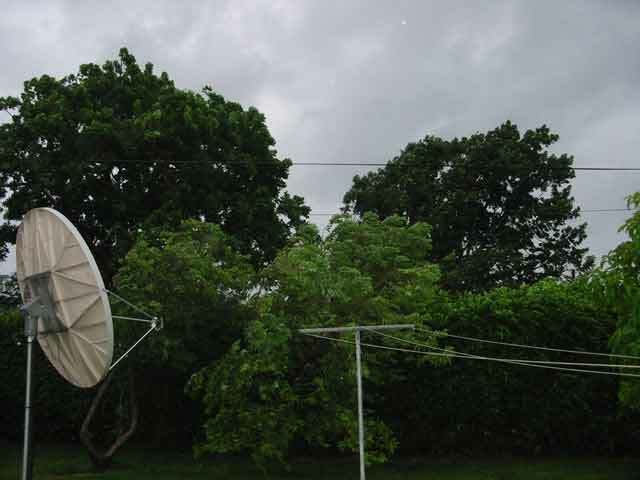 - Digicel said all its cell sites remained operational throughout the storm. - Reports started to emerge of people complaining about the conditions and organisation at Owen Roberts International Airport during the evacuation, with long waits and a lack of information. 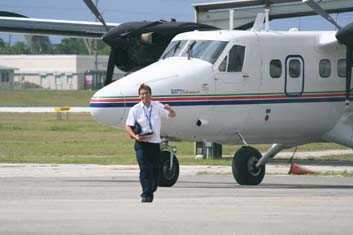 But tributes were also paid by many members of the public to Cayman Airways and its staff for their efforts. - It was confirmed this morning that some 7,000 people - local residents and tourists - were evacuated before the storm. Should be getting much calmer in the next hour. Yet, as you can see its safe enough to be outside in the car park. We have been informed that NHC here are meeting to decide when the curfew will be lifted and the all clear given. 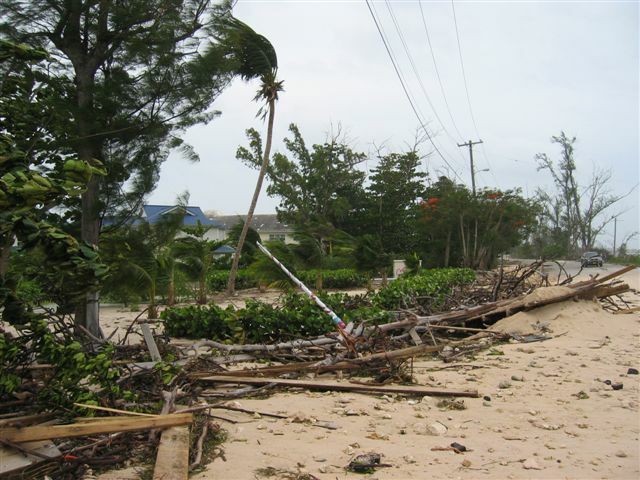 The Caribbean Utilities Company (CUC) is working assiduously to restore power to a number of areas throughout Grand Cayman which lost electricity due to wind damage from the outer-bands of Hurricane Dean. Sacha Tibbetts, Manager, Engineering Service for the CUC said that 11 of its 23 circuits are out of power. He said the CUC teams are on the road carrying out repairs and have restored power to some areas, but are being severely hampered by the still high winds associated with Dean. Mr. Tibbetts is however optimistic that full restoration could be achieved within 24-36 hours. 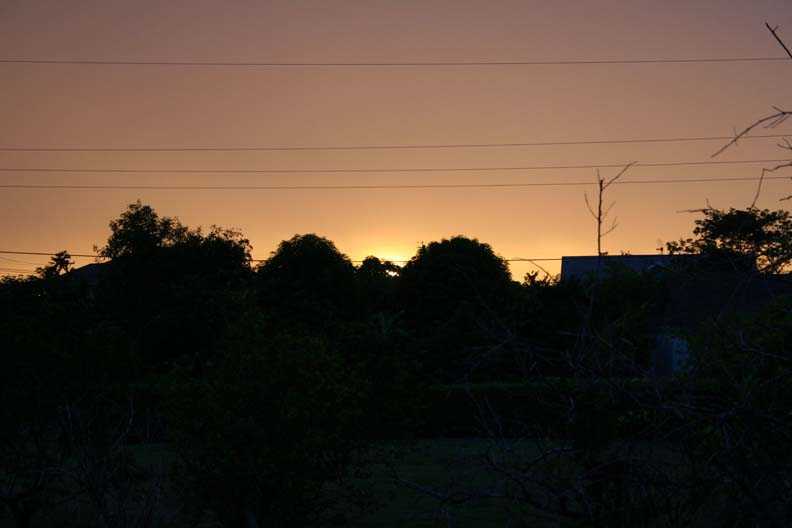 In the meantime, the CUC has warned residents to stay away from down power lines as well as those which are low hanging as this could be life threatening. All other areas in the districts listed above are with power. Hurricane Dean was at its closest point at 6:00am today, at some 102 miles off Grand Cayman with wind gusts of up to 57 mph. Tropical storm conditions are expected to continue through this Monday afternoon. The curfew declared by the Royal Cayman Islands Police remains in effect and residents are urged to stay off the roads to avoid prosecution. 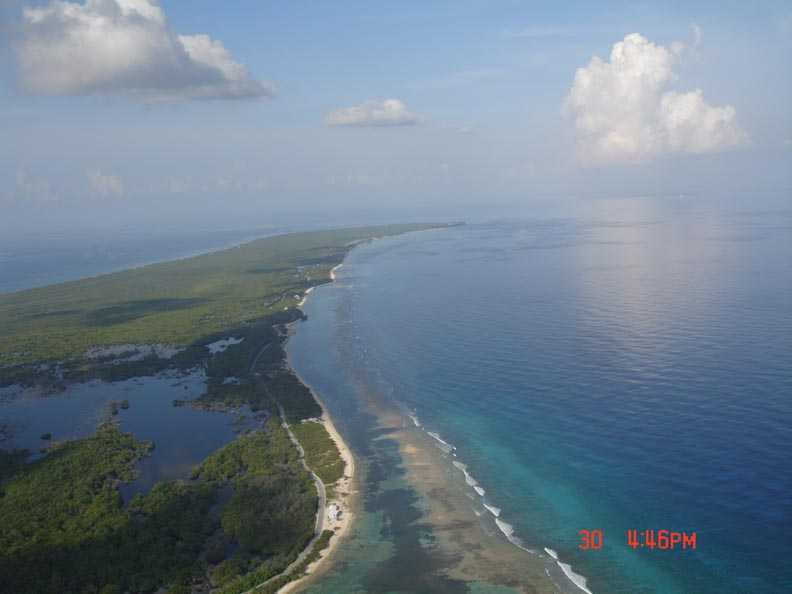 All is clear on Cayman Brac. We were very lucky with minimum damage and some debri on the roads. got some pics from windsor village and will try to get pics of heritage club. very windy in areas so please be careful. Curfew was lifted at 2PM. This was information passed to me by a friend that told me such info came from a member of the RCIPS. Please feel free to correct this post. All the other files of the MMS are as attachements. attached files in this email to same folder and execute the file 'mms.smil'. Well the water is back on. I turned my genarator on. Got keep the fridge on! is out only in certain spots.. 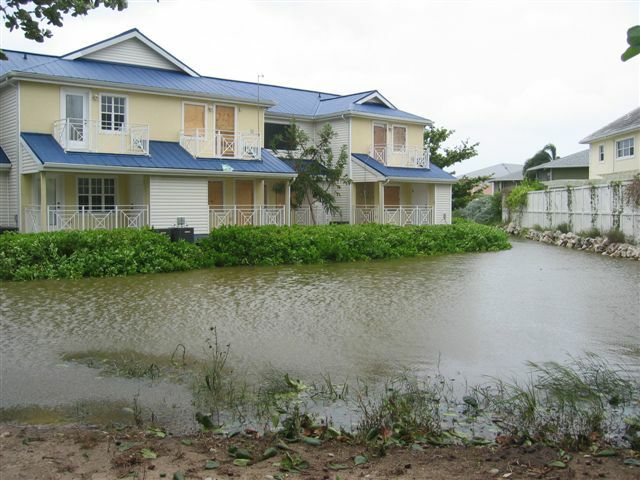 Most of West Bay Road's water has been turned back on. I guess they're working from WB upwards, so everyone should have water pretty soon! I am located off Walkers Road, (South Sound end) and we do not have water yet. But, from Taylor's report, if WB has water, hopefully we will have ours soon. I'm not sure about the rest of the island, but as far as I know parts of WB now have running water. I live on North West Point and have talked to someone that lives nearby the WB post office area; they also have water. If you need to use the loo (toilet, bathroom etc), and you were sensible enough to fill up your bathtub with water (or had other reserves of water), use a big jug filled with water to flush. You can do this by standing over the loo and pour from a distance (about two feet from the actual basin). All the contents will wash down. Try not to put toilet paper in the loo though. Yucky I know, but useful nonetheless. If anyone is tempted to venture out whilst there is a curfew in the Cayman Islands, please don't. Although the winds do not seem so threatening, there is a reason why curfew is in in place. This is largely due to flying debris. Please, fellow islanders, stay inside until further advised. If you have a radio, tune it into 88.9fm (Radio Cayman). They will advise, soonest, when curfew is lifted. "‘The most recent weather reports indicate Hurricane Dean remains a very dangerous Category Four hurricane. It is located approximately 115 miles south-southeast of Grand Cayman, moving at 21 mph and we are experiencing winds of up to 60 mph." "1. Commissioner of Police Stuart Kernohan announced this morning that conditions on Cayman Brac and Little Cayman have improved to the point that the curfew on those two islands will be lifted at 9 am this morning. 2. 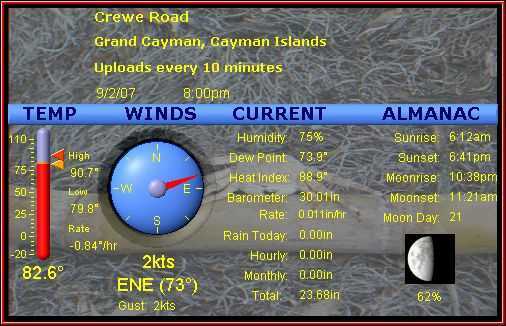 On Grand Cayman reports have begun to be gathered on the overnight and continuing impact of the heavy winds and high seas. Among the first situations being monitored is flooding in the Savannah “gully” area. The Fire Service was dispatched this morning to undertake a reconnaissance of the area. Authorities said this morning that if conditions were to require evacuation, the residents would be advised and assisted to relocate. 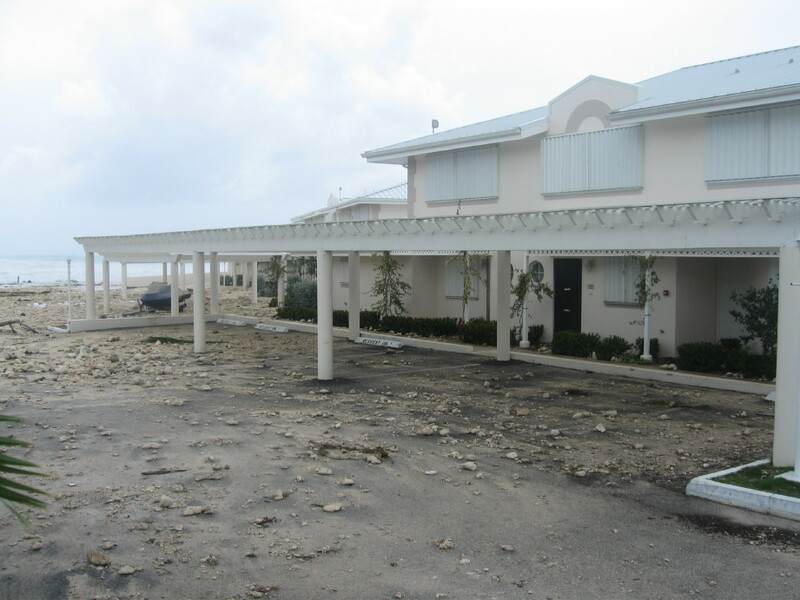 The curfew remains in effect on Grand Cayman. Residents are asked to stay in doors and monitor the local media." Gusts are pretty wild right now. 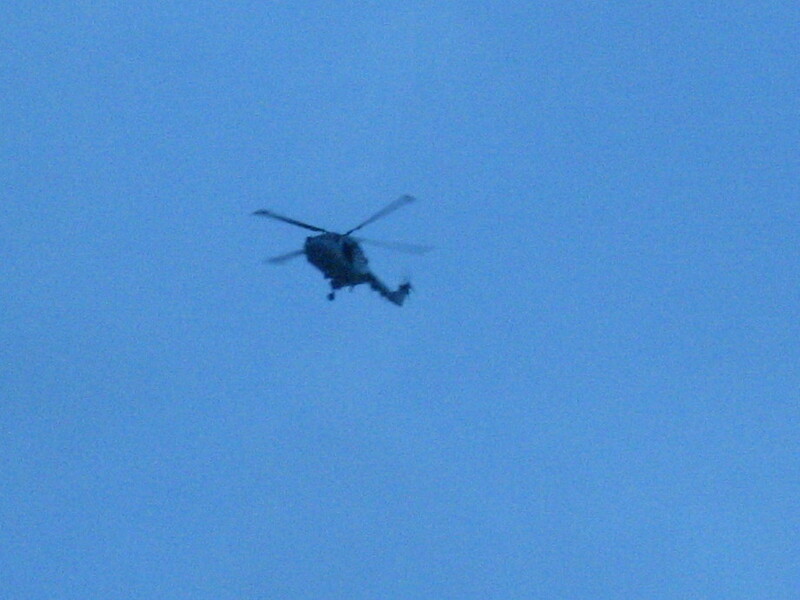 Offically don't know what they are, but definitely not safe to be outside as it was earlier. Have received two messages from Colonial Club on SMB. Gusty winds and some rain. No damage. Power, telephone and internet all up and operating. Water turned off Sunday night. and internet phones etc. but no water. Well it is very breezy where we are (near Sunny Smiles pre-school). There is one tree down along our road, but unfortunately I cannot see beyond that. Curfew is still in place, but fortunately we haven't lost electricity. Around 1am this morning, when the winds picked up quite considerably, I was outside and a bird (an Arnold I believe) got blown into the wall of our house. I helped it back on its feet, then its wings flapped, and for a moment I thought it wasn't going to be able to fly, but after putting it in an area shaded from the wind, it continued its journey. Yesterday, I chopped down my first tree - and shouted timber (more for effect than anything else!!). Being from England all the experiences mentioned above will stick with me forever. I am just so glad we didn't get badly hit. Will report later, hopefully with pictures once curfew is lifted. Winds are consistant at about 20-30 mles an hour with some pretty high gusts, about 50-55 - am told ... Fruits are trying to hang on to the trees, but heavier ones are falling. Bannana trees are begnng to give too....yet all in all, damage is slight. "8 am Update from CUC: some areas east of Linford Pierson Hwy up 2 Beach Bay off (not Prospect or Northward) & all areas E of Midland Acres above BT are off EXCEPT Rum Point 2 Old Man Bay as being served by sub cable, also EAvenue -south SMB area is off. All will remain off as winds of approx 55mph now 2 strong 2 send crews out. Will commence restoration when winds drop below 35mph after eye passes later." Lastly, I know my best buddy Kel is monitoring us in Washington State ...thanks for your "cheers" and will get those pictures to you as soon as. Get internet again! end of Snug Habour on SMB. high 40's to low 50's. angry with the wind though. one hinge. Some water forced through the hinge. island. It's worse than Emily, but no where near Ivan. As Dean continues on his westward plow through the Caribbean, and now south of of us in Grand Cayman, the winds have increased to 20 - 30 mph with higher gusts, pulling more east to south east now. Power is still on in my area. Just spoke to a friend in Frank Sound and they were without power. Talking with a friend who lives along the south coast, "Spotts straight" she reports "HUGE" waves. Hopefully she will get some pictures. With the curfew in place I am home bound until it is lifted. Looks like he south facing shoreline will take a beating from the waves. Just opened my garage door which faces north to let the dogs get a break. Leaves are strewn over the ground, but from my vantage point no trees down....wait let me check my banana plantation....banana trees are still standing, a few are down. Just had a gust to 36mph. Rain fall has been minimal so far 0.38". Thanks to all for the e-mails and your comments. Keep safe, especially those along the south coast. ps. Great to see so many reports. Those posting, it would be helpful if you would state your location. 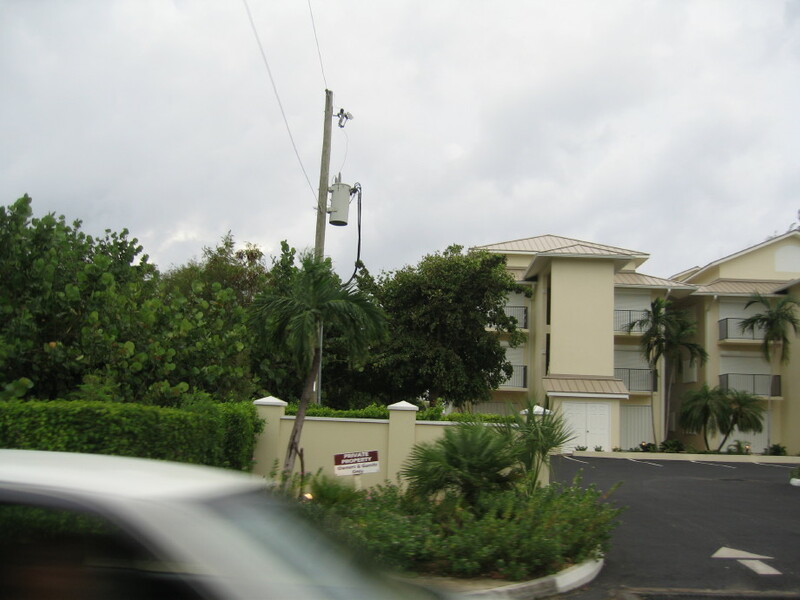 Even though Cayman is a small island, weather conditions can differ throughout the island. 6:48 am. Blustery and overcast, occasional drizzle, easterly.. Local meterology station nearest to us in Savannah is reporting gusts up to 43 mph at the momment. Little rain, our west facing porch is dry. Cats sitting on the edge observing with interest. Cayman's famous bush chickens are up and about crowing and rooting in the long grass. A couple of the taller plaintains have fallen but shorter Cavendish bananas still standing. A large dead mango tree that died after Ivan has up-rooted, top heavy with vines. All my neighbours yards are full of cars, brought inland to higher ground. We can hear the surf at Beach Bay, but we can hear it pretty much any time. As Jarrett has said CUC still on, they have said no fixed plan to turn off. The large concrete reinforced poles installed after Ivan are not moving at all. Just came back in from a little walk outside. Not much to see except some the wind blowing the trees. It's windy ranging from 10-25 with gusts to 40. Rain accumulation now at 1.1". Temps up to 82. The power is flickering but it stays on - so far! Radio reports that there are 2200 people in the shelters. The peak of the winds should hit us around 10am. Curfew is still on, so I guess not pictures of the sea. well its starting to blow. Lots of rain, Power is still on!! thank you Cud. I'm not sure why the water went out after 9pm...... every one has there own protocol when things like this happen, just hope that it comes back on soon, however if it shouldn't bath tubs are full and ready, lots of water on hand. My anxiety tends to go up when storms like this affect our area....... what I'm trying to say is that I don't sleep well with this stuff going on.....I think that I'm not the only one with this problem......I'm looking forward to a good nights sleep. I just looked out my little window(only one not bored up) and its starting to get light....YAAAAAAAA! - Brother Dean is here! Well its almost 6am and we still have power, amazing. Thank you CUC. Wind is really howling out there now 25 to 30 with stronger gusts. Tree's are really starting to bend now. Hope everything stays were it is. Will get pictures once it gets a little lighter out. Stay safe everyone. Belize watch out for this one it is for real. Was woken up this morning at 5am by continuous thunder. Though the roof was going and the hurricane force winds were here with all the rumbling! Thankfully the power and telephone are still one. Current weather is 0.5" rain, winds at about 20 gusting to mid 30s and coming from the NE to SE. Variation is probably because the weather station is much lower than normal. Only about 25' above the ground. It's cool at 75F but that's Ok in case the electricity goes off. I heard a storm band come through around 3:30am or so. Dean is here! Will try to get some pictures at daylight. Winds have increased since I went to bed at 11pm, and it just began to rain. So far about 0.18". Winds are gusty, ENE at 20 to 35 MPH here in Crewe Road. The station located in East End is reporting 38 mph average with gusts to 57mph. 'Brother Capt. Chris', I am proud of our national airline 'Cayman Airways. You guys did a fantastic job. I know it because you worked some of those 'Red Eye' evacuation flights. Thank you all at Cayman Airways. Winds are getting stronger and we have just had some rain. It will be daylight when the winds are at their worst so we may be able to get a peek outside to see what, if anything is going on. Other than the rattling of the accordian shutters I don't hear anything except the wind and it is not howling, just gusty and certainly picking up. This is a fairly sheltered location and I have not been in touch with anyone elsewhere. The first rain and first substantial wind hits Georgetown.... it comes very rapidly. We see from the nhc that the eye will probably miss us, but it looks like we are in for alot of rain for the next few hours. 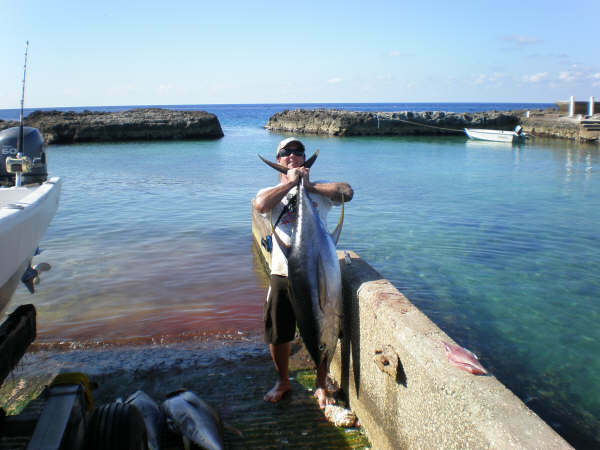 Older reports from the Cayman Islands have been moved to another page.